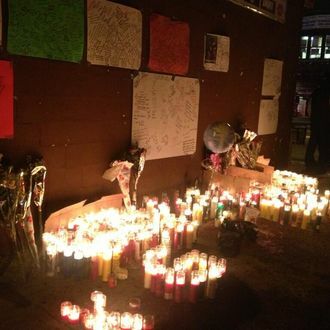 A Brooklyn vigil for 16-year-old Kimani Gray, who was shot by police on Saturday night, became a demonstration that turned violent on Monday night, as a frustrated crowd of about 70 to 100 people marched in protest and threw rocks and bottles at police. The cops have said Gray pulled a revolver, later found to be loaded, and aimed it at the two officers who shot him. But one witness at the scene told NBC that he hadn’t heard police identify themselves to Gray, and a friend of Gray’s said the 16-year-old had yelled “Stop! I’m not running,” as police shot him. On Monday night, with the neighborhood’s frustration over the incident still raw, a few separate conflicts with police appear to have taken place as the protesters — mostly teens, according to NBC New York — made their way through East Flatbush. DNAinfo reports that “The violence started about 8:30 p.m. when ‘a large, disorderly group [began] throwing bottles at police’ at Church Avenue and East 48th Street, an NYPD source said.” NBC New York reports that the crowd marched to the 67th Precinct, at Snyder and Nostrand avenues, where they threw rocks and bottles at the building. City Councilman Jumaane Williams has been tweeting from the scene of what he described as “a peaceful vigil that devolved into a riot.” His most recent missive said the crowd was getting smaller, but earlier he had estimated it at 60-100, and described the scene as “tense,” with garbage turned over, windows broken, and the Rite Aid worker attacked.